Sean McGeehan is a junior Media Studies and Production Major from King of Prussia, Pennsylvania. He was introduced to working in media during high school when he started writing for his school newspaper, where because of his work he was inducted in to the International Quill and Scroll Honor Society. Since arriving at Temple, Sean has been involved in many different organizations around campus including the Temple News where he wrote as a sports journalist during his sophomore year. He is currently interning with NBC sports Philadelphia for the spring semester. He has been a member of OwlSports Update since Fall of 2018 and hopes to one day become a sports broadcaster on one of the country’s major networks. His favorite sports to follow are basketball, football, and MMA. Dan Wilson is a junior journalism major with a minor in digital marketing. He is from Wynnewood, PA and is a 2016 graduate of Lower Merion High School. Dan started with OwlSports Update as a volunteer during his sophomore year and has been an anchor since Fall 2018. He has interned for PHL 17 Morning News, currently works as a member of the street team at 94 WIP as well as an on-air sports talk host on WHIP radio. Dan is also a fan of the Eagles, Phillies, Sixers and Flyers. Sarah Metts is a senior Journalism major with a focus in broadcasting at Temple University. She is from Levittown, PA and graduated from Pennsbury High School. Sarah is currently an anchor for OwlSports Update. She made the decision to transfer from Florida Atlantic University in Boca Raton, FL to Temple when she was a sophomore. During her time at Temple, she has anchored and reported for Philadelphia Neighborhoods on TV where she was then nominated for a Mid-Atlantic Emmy under the Arts and Cultural Affairs category. After just one semester at OwlSports Update, she fell in love with the crew and the show. In addition to anchoring for OwlSports Update, Sarah is also captain of the Temple Cheerleading squad, and a member of the Delta Phi Epsilon sorority. This past summer she was a morning news intern at PHL 17. Sarah has always been a huge fan of all things sports, especially Philadelphia sports. In Sarah's free time... wait what is free time? Andrew Adames is a senior Media Studies and Production major who grew up in Warrington PA. After graduating from Central Buck South high school in 2015, where he was involved with their News show, he knew his next step was to come to Philadelphia and study at Temple. This is his second semester with OwlSports Update and his only regret is that he didn’t join sooner. He loves being able to cover sports for his University and putting out the best show possible. He hopes to be involved in the world of sports media after graduation. Ali McCann is a senior Public Relations Major from Hazleton, Pennsylvania. She aspires to start a career in sports journalism post graduation this spring. She has spent her time here at Temple as a reporter and now anchor for OwlSports Update all four years of her college career. She has interned for the Philadelphia Flyers and NBC Sports Philadelphia. Her proudest work follows her latest piece on Temple football’s assistant equipment manger who was diagnosed with leukemia that aired nationally on ESPNU. Her dream job is to be a sideline reporter in the MLB for any team because baseball is her favorite sport. Celena Sanchez is a senior, majoring in journalism with a concentration in broadcasting. She is from Lancaster, Pennsylvania and transferred to Temple University as a sophomore. In the past year and a half, she has interned for two daytime talk shows, one in which was nominated for an Emmy. Celena started as a reporter for OwlSports Update and is currently an anchor for Owl Access Pass. She also does the weather for Temple Update, the morning news show at Temple University. Vince Coll is a senior journalism major and nutrition minor at Temple University. He is from Drexel Hill, PA and went to high school at Upper Darby high school. Vince is an anchor on Inside The Nest, and a first year member of Owl Sports Update. He spent his first three years reporting with the Temple Update SportsDesk- where his roles included Sports Director, Reporter & Anchor. He has covered Temple Football in Boca Raton, Notre Dame, St. Petersburg, University of Connecticut and Annapolis with Temple Update. He was also one of six college media members credentialed for the 2017 NFL Draft in Philadelphia. In addition to anchoring Inside The Nest, he is also the Campus Connect Reporter for the American Athletic Conference. Last semester, he studied away in Los Angeles where he interned full-time at NFL Network. In addition to NFL Network, he has also interned at NBC Sports Philadelphia and NBC 10. On Temple Football game days, you can hear Vince on WHIP radio as the Color Commentator alongside Max Mirkin. He gets his football analysis skills from playing wide receiver at Upper Darby high school where he was an all-county and all-league selection during his junior and senior seasons. In his free time Vince likes to watch college football, produce and record music, hangout with friends and family, and travel on a budget. Dan Bartels is a senior journalism major at Temple University. He is from Downingtown, PA and went to high school at the Downingtown STEM Academy. 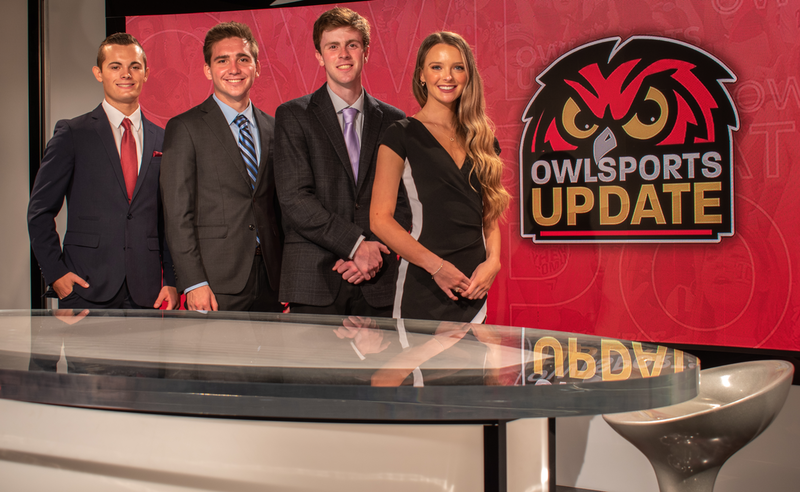 Dan has been a member of Owl Sports Update since the beginning of his sophomore year (Fall 2015). He has worked as a lead reporter for Inside The Nest as well as an anchor for Owl Sports Update and is currently an anchor on Inside The Nest. He is also a member of WHIP, Temple’s student radio station, as an on air host. In his free time Dan likes to hang out with friends, eat good food and watch sports. His favorite teams are all four major Philadelphia pro teams. Professor Matt Fine oversees this award-winning staff of about 55 students in creating all four shows produced by OwlSports Update Productions: OwlSports Update, Inside the Nest, OwlAccess Pass and Courts in Session. His duties include overseeing all staffing and all operations in pre-production, production and post-production. In the past year, Prof. Fine is proud to have his OSU crew recognized nationally and regionally with many of the industry’s top student awards, including best talent, best sports report, best social media campaign and best vodcast. Jimmy Pirolli is a senior media studies and production major at Temple University. He is from Richboro, PA and went to high school at the Notre Dame High School. Jimmy has been a member of Owl Sports Update since his first semester on campus freshman year (Fall 2015). He has worked numerous jobs on crew for Owlsports Update including photographer, editor, technical director, and audio operator just to name a few and is currently a producer and director for “#OwlAccessPass.” He also has produced various other shows on TUTV and is an on air host of “We Make the Call” since his freshman year. In his free time Jimmy enjoys to spend time with his family and friends, watching sports almost 24/7 and exploring our beautiful city of Philadelphia. His favorite sports teams are the Pittsburgh Steelers and Liverpool Football Club and football is his favorite sport! Alyssa Mancuso is a senior Media Studies and Production major, concentrating in television production. Alyssa began her journey with OwlSports Update in the fall of 2017, working behind the scenes as a photographer and editor. She has since worked her way up to producing and directing the show this year. Outside of TV3, Alyssa is often touring Annenberg with prospective students as a Student Ambassador for Klein. She can be found in a few places around campus, particularly in Edberg-Olsen Hall, editing practice and game footage for the university’s football team as an intern in its video department. She is also heavily involved with HootaThon here on campus, serving as the Video Production Chair to aid in raising funds and awareness for the Child Life Department at CHOP. Jake Zebley is a sophomore Media Studies and Production Major in his third semester with OwlSports Update. Jake is a graphics coordinator for Inside the Nest. He is also the post-production supervisor for Temple Tonight and is a member of the Temple Climbing Club. After graduating, Jake aspires to be a director or producer for a news station. He has a fervent deep-frying passion and his favorite kind of pizza is pepperoni and black olive. Victoria Bremmenkamp is a sophomore Advertising major, Digital Marketing minor, and this is first semester with OwlSports Update. Despite being born and raised in Brazil, half of her family lives in Massachusetts, which led to an obsession for Boston Sports (#GoPats). Her passion for football lead her to join Inside the Nest’s previously all-male staff as Social Media Coordinator fall 18, and she now obsesses over basketball with the same passion. So if you follow any of our social media - which you should. You should follow all of them :) - she’s the one you can interact with! Erin Steffe is a junior Media Studies and Production major at Temple University. Erin developed a passion for sports, as she grew up in a family of Philly fanatics. She knew that OwlSports Update would be a great fit for her as she began volunteering her first semester at Temple. As a part of the production crew, she learned to technical direct and execute various studio jobs. In November 2017, she was promoted to a show producer. In addition to OwlSports Update, Erin currently works for Temple Football and the Children’s Hospital of Philadelphia, and enjoys freelancing for the Philadelphia Phillies and Eagles. Growing up in Gilbertsville, PA, Erin was a dancer for 15 years and enjoys going back to the studio and teaching. Kristen Applegate is a senior Media Studies and Production major at Temple University's Klein College of Media and Communication. This is her 3rd semester with OwlSports Update, and her 2nd as a show producer. When not at Temple, Kristen works as head videographer for Upper Darby Summer Stage and is a producer for her local district's television channel, SETV; she also interned at Philadelphia lifestyle site Wooder Ice this past spring. Kristen hopes to work for NBC Sports Philadelphia or at a local news organization after she graduates. Ian Morris is a senior Media Studies and Production major. His time with OwlSports Update began in the Fall of 2017 as a reporter. He then moved to graphics coordinator until eventually being promoted to producer for OwlSports Update. He attended Cheltenham High School in Pennsylvania, only a short trip down the road from Temple University. Ian has always been a dedicated Philly sports fan as he has a “Trust the Process" tattoo as well as an Eagles Super Bowl 52 Tattoo.